Gibraltar is a place of numerous disputes over the centuries. The territory once conquered and ruled by the Berbers in 711 A.D. had been waiting more than seven centuries to get back into the hands of the Spaniards. Not for long because in 1704 during the Spanish Succession War territory is occupied by Britain. And so it remains up to date. 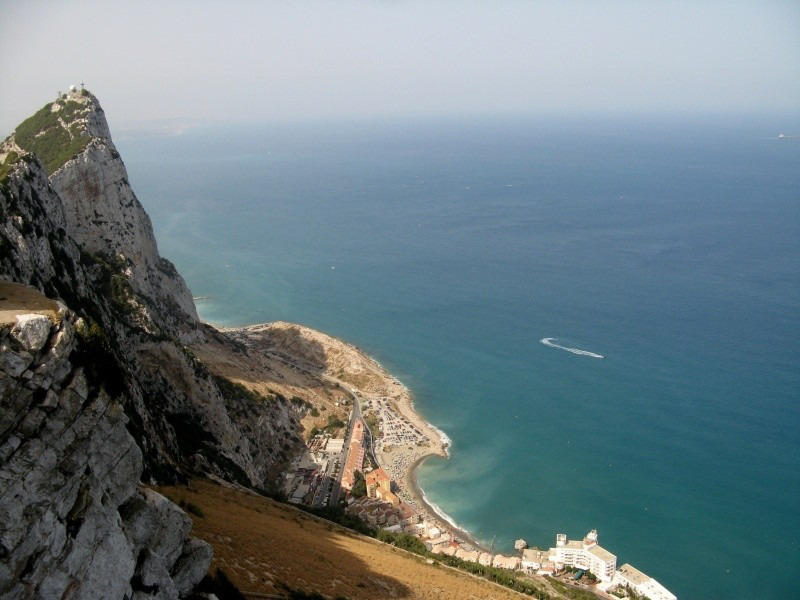 A 426 meters high the distinctive looking Rock of Gibraltar is a bona fide limestone fortress. As the only summit in the area it looks quite unnatural along the turquoise Mediterranean Sea. It gives a strategic point of control over the Strait of Gibraltar, the only passage from the Atlantic to the Mediterranean. For this reason, the tiny, having only 6.5 km² territory has played a leading role in the past. Today, Gibraltar is an interesting travel destination. This may be a British territory however it find it hard to recognize things it has in common with England. The only thing coming to my mind is the English language and Guinness beer sold here with a sterling price tag. At the border crossing IDs are checked, because it is not anymore the Schengen zone. Signposts lead up through a winding road upwards. On-site we visit major points of interest. We go up to a St. Michael’s cave. Then we traverse the tunnels of historic siege guns. We visit the British colonial shop. Definitely the most interesting to see are ubiquitous macaques. 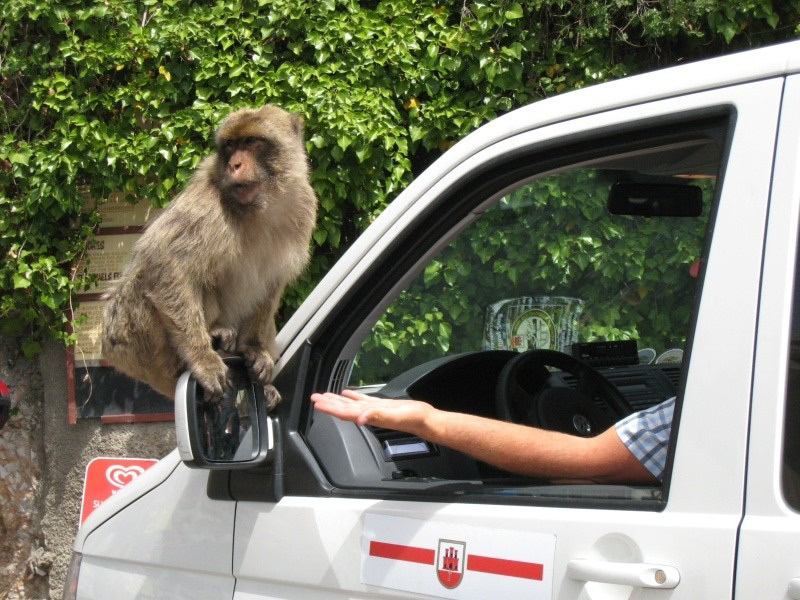 There is a saying that when the macaques leave the Rock of Gibraltar, then England would irretrievably lose Gibraltar. At the moment it doesn’t not like it going to happen, as the monkeys are everywhere. They are pretty smart, looking for food and request their portion. The monkeys even try to open a cupped hand holding a piece of banana. They are friendly, yet can make a prank. Some of the macaques seem to be patiently waiting for an opportunity to steal a lady’s handbag, a camera, or take away a hat of one’s head. In a forty degree heat we climb to the top of the rocks going up a few hundred steps. I admire a beautiful panoramic view at the top. In the distance I see Atlas Mountains merging from the clouds in Morocco. Turquoise water and sandy beaches, luxurious district of the bay and marina with yachts. Numerous picturesque sailboats appear on the vast horizon of Atlantic Ocean. Being at the top without a problem I can see all the ships at any given time to flow through the Strait of Gibraltar. The British knew what they were doing taking a rule over this little piece of land, now one of the most densely populated territories in the world. This has further implications. Not all the sun-longing British managed to find their place in Gibraltar. Coming towards Malaga we stop in Marbella. Out of various restaurants from all over the world we choose an English one. Out of curiosity. Here comes is a positive surprise, as a welcoming waiter brings a decent steak. I eat my fill. After the dinner I learn that the whole area is partially occupied by the British. I suppose that the substitution of rainy England for a sunny and full of life Spain is not an accidental, but a well-thought-out choice.